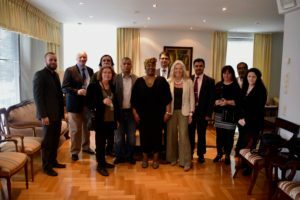 On Tuesday the 4th of September, the European Journalists Network were graciously invited by Her Excellency, Ambassador Carmen Smidt, to attend a journalists dinner at her official residence along the seaside of Helsinki. To no surprise, at the onset we were warmly greeted by embassy staff who escorted us to the balcony for drinks. With a view of the garden and sea, a discussion of African Union representation and an anecdote of the Ambassador’s Finnish ice fishing experience, was underway. Upon settling down at the table for a dinner of divinely prepared oxtail stew, pap (a South African staple, akin to polenta), complimented with selected wines from the tip regions of Africa, Ambassador Smidt captivated her EJN guests with pressing issues and concerns, ranging from her diplomatic experiences with the fragile state of South Sudan, Finnish and European trade & tourism with the African continent, to the pending land expropriation legislation of South Africa. All in all, it was a memorable evening lubricated with laughter accompanying the serious reflection of cultural tolerances needed for world relationships to progress and flourish. 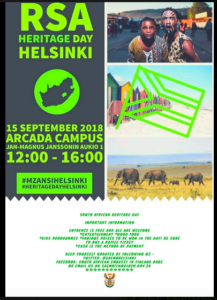 The EJN is most grateful to Her Excellency and staff for a lovely evening, and we hope to see them all again at the South African Heritage Day event, to be held at Arcada Polytechnic University, on the 15th of September.